Last fall, I knew just how I wanted to brighten and heighten the shadows of a mountain laurel. Biding my time, I found the perfect subdued container at a winter sale, and in spring, landed a sparkler sedge Carex phyllocephala ‘Sparkler’. I’d planned to fill this spot with Salvia coccineas in May, but alas, soggy soil and being doggoned pooped ended that vision, at least this round. Native Salvia roemeriana, hummingbird-love Dicliptera suberecta and striking red billbergia are on their own for now. For lightweight filler in the bottom of the container, I hit the dollar store and stuffed 1/3 or so with plastic kiddie toys. Plastic nursery pots are a super idea, but in a clean-up mission, I’d recycled/donated them. Viewers also suggested water or soda bottles. In larger containers, one cat mom recycles plastic litter containers, upside down. Native Salvia coccinea peps up part shade where hummingbirds, butterflies and bees quickly find them. Morning sun is great, but do avoid direct-hit afternoon sun. Usually, they drop dead at the first frost but can generously re-seed. Pollinators will find them just as quickly if you can only plant in containers. These days, you’ve got lots of options for color and size. Find out more as Daphne’s Plant of the Week. Questions about fungal disease are still #1. So, what’s going on with Craig Burnett’s chinkapin oak? It’s possible, Daphne tells us, that there was a fungal infection of some sort earlier in the year (during all our rain and cool weather). As leaves develop, tissue surrounding the infection sites starts to die and turn brown. It’s also possible that the damage comes from herbicides or too much fertilizer. Find out more. So many people are moving into “close encounters” neighborhoods, where a mere strip separates homes. 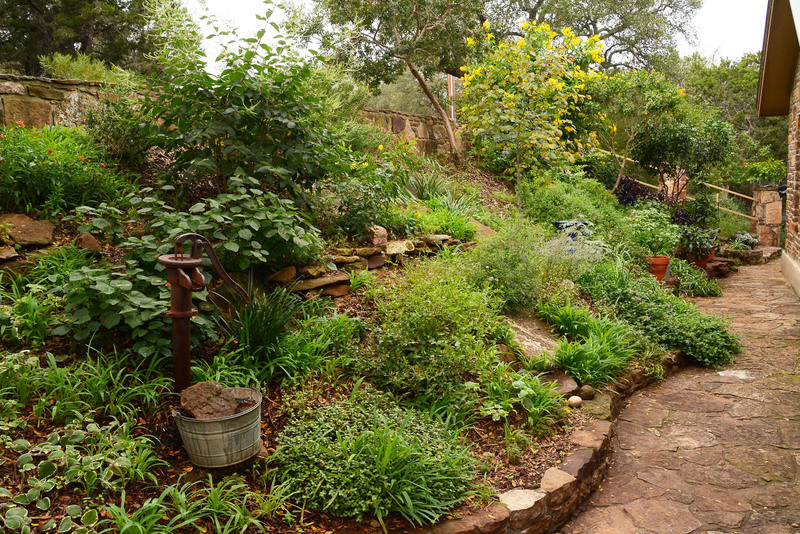 Many of us simply have small yards to start with. This week, Laurin Lindsey and Shawn Schlachter of Ravenscourt Landscaping & Design in Houston, put their gorgeous stamp on stamp-sized properties. A complete landscape and design team, including licensed irrigation, they combine sensitivity to clients’ needs, homegrown food, and artful structures and lighting. We illustrate their amazing before and after pictures in Tom’s interview, but here’s an “after” I love. For privacy against a new McMansion next door, this arbor blocks the view, but lets in light. Laurin often includes planters for food: here, right near the kitchen door. One technique they use for privacy, to hide utilities, or just to power up blank walls is Shawn’s custom made lattices backed with acrylic mirrors. They reduce a lot of lawn in their designs. Here’s one design where they activated dimension with tiers of dimension that brings the family back outside, day and night. Check out their blog for their makeover stories and philosophies and of course, Ravenscourt’s very personable design site to help you if you’ve decided you need some help! John Dromgoole clevers things up on porches, patios, and balconies. One is the Incredible Porch Hangar/Tree that lets you layer pots in cute angles. Anchor its chain on your porch or patio for instant space-saving vertical dimension. The Incredible Plant Stand is really that. Starting with a large pot on the bottom, add on smaller pots to grow a lot in limited quarters. Another trick I’ve often used is an inexpensive pot clip, like this. On tour, Delta Dawn Gardens designer Leah Churner includes pot clips in her vertical designs, even on her own apartment balcony. A designer who goes for beauty with native plants and organic, drought-tough techniques, she adapts her creative flair in tiny spaces. At home in a two-story apartment overlooking Zilker Park and downtown Austin, Leah’s window wall meant intimate connectivity between indoor and outdoor rooms. Outdoor rugs quickly warm up and personalize footing that you can’t paint in a rental. Vertical techniques are key in space-challenged spots. On her shady balcony, star jasmine is an easy-control evergreen vine. Leah jazzed up inexpensive terra cotta pots with a can of gold spray paint. I’m so doing this! This mirrored gold sunburst pulls it all together. Contemporary macramé saves the day, where the beads on this one match some of her interior colors. Inexpensive mirrors—even thrift story finds—enliven and enlarge, and never need water! As in garden beds, often she works in groups of three for uncluttered, visual promotion. Leah’s fortunate that her apartment has two floors. Downstairs on rock-solid ground that supports the weight, galvanized stock tank planters permit larger plants,like bamboo muhly, and require less watering. Trellises, mirrors, and stacked plants disguise the fence and give her more options, always good for a plant-crazed person! She uses extra containers, stones or bricks to elevate attention (and allow drainage), here for an edible chile pequin. To cover cold-tender plants in winter, like pot-bound chile pequin, later she filled these cinder blocks with sand to firm up PVC hoops to support warming row cover. Stop by Drinks Lounge (Arlo’s cooks up delicious vegan noms) and check out her galvanized stock tanks that do what you can: anchor a patio. And at The Brixton downtown, big-time trellises shade and dramatize with Alamo vine underplanted with vibrant bougainvillea, grasses, and pollinator perennials. So much more, so watch right now!